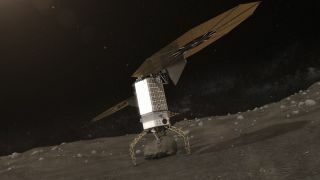 Artist's illustration of a robotic capture probe grabbing a boulder from a near-Earth asteroid. Dozens of students from 14 countries around the world came together recently to map out a manned mission to a captured asteroid in lunar orbit — a project very much like one NASA hopes to achieve by 2025. The 32 students gathered in late March for a weeklong competition known as the 2015 Space Challenge, which was hosted by the Keck Institute for Space Studies (KISS) at the California Institute of Technology in Pasadena. The event culminated in a winning asteroid mission design on March 27. "These were handpicked by the student leaders of the Space Challenge from over 200 applications from 110 universities in 19 countries," Prince said. The group of students was split into two teams: Explorer and Voyager, named after NASA's first (Explorer) and farthest-traveled (Voyager) spacecraft. Each team had a diverse set of talents. Members of Team Explorer give a spirited cheer as they record their team video. "Most of the participants have an engineering background," said Jay Qi, a Caltech Ph.D. student who was a 2013 participant and served as this year's technical lead to help organize the challenge. "A smaller number have varied scientific backgrounds, such as physics and geology. We even have one student who is studying space architecture [at] Columbia [University]." So, what were these young people spending roughly 75 intense, sleep-deprived and pizza-fueled hours working on? "Each team was given the basic ingredients of a crewed asteroid sample mission," Qi said. "An asteroid sample would be delivered via robotic probe to an orbit about 61,500 kilometers [roughly 38,214 miles] from the moon. It will be a type-C [carbonaceous] asteroid … The crew will have to interact with the asteroid sample, do resource extraction and in-situ resource utilization." The challenge mirrors NASA's real Asteroid Redirect Mission, which aims to pluck a boulder off a near-Earth asteroid using a robotic probe, then drag the rock into orbit around the moon. Astronauts would then visit the asteroid chunk by 2025. The first order of business was to sort out their roles within the working group. "Team leadership was self-selected," Qi said. "Each team was responsible for figuring out their own decision-making structure. Then, they split themselves into smaller teams and subsystems, and team leads responsible to the project manager." Koki Ho, who is pursuing his Ph.D. in space systems at MIT, said the competition's structure taught him about the importance of teamwork. "The teamwork is very important," Ho said. "The people involved have so many different backgrounds; everyone was so actively involved. We spent 12-hour days working together." The intense real-world structure of the exercise impressed the participants. "We started out with some ideas that were really out there," said Samantha Rawlins, an undergraduate student at California State Polytechnic University, San Luis Obispo, who competed in the event. "Then, we went to JPL [NASA's Jet Propulsion Laboratory in Pasadena], and even they said that some of the ideas were too far out. They told us to be more conservative, and they had good justifications. It's not that they didn't want us to take risks, but only when we needed to." On day six, the teams wrapped up their efforts and completed their reports. At midday, the participants filed into an auditorium to give their presentations and turn in their reports. For both teams, crew safety and operational autonomy were high priorities. In-situ extraction of resources and demonstrations of the utility of those resources were emphasized. Team Explorer planned to grow lettuce in asteroid soil, and outlined plans for a steam-powered rocket fueled by ice found on the asteroid. Their mission would last 22 days. Team Voyager laid out a similar proposal, opting for a 39-day expedition. After the presentations, questions were invited from the audience, which included the jurors who would convene to choose a winner. One of the more challenging inquiries came from one of the jurors, former NASA astronaut Garrett Reisman, who questioned a plan to perform multiple dock-undock operations between NASA's Orion spacecraft and the asteroid research platform using a robotic arm. What if it didn't work? After a nervous consultation with his team, the presenter turned to the audience with a smile. "We'll study this further and get back to you," he said, which was met with laughter and applause. The event concluded with an awards banquet that evening. After the opening remarks, the room fell to a hush as the winner was announced. Team Voyager took the prize. Team members high-fived and cheered as they claimed their trophy. But winning seemed to be just a minor distinction, as everyone was elated by the weeklong experience. "It was unlike anything else I've ever experienced!" Rawlins said. "It's easy to get bogged down as an undergraduate, easy to forget how much potential you have working together with other smart students. But once you're in this kind of group environment, it's just incredible how much you can get done. Everyone is so focused — it's amazing." In the end, the students came away with a true appreciation for what they had accomplished and the impact they hope to make on future space travel. "I was beginning to think that engineering was spending the rest of your life optimizing a 1 percent increase in efficiency," Webb said, "but I know now that we can still dream — and do great things." More information on the Caltech Space Challenge can be found at http://www.spacechallenge.caltech.edu.